How Will Meaningful Use Rules Affect PACS? There was much ado earlier this year about the Centers for Medicare & Medicaid Services’ meaningful use rules for EMRs, but one aspect of the new rules that didn’t get much attention outside the radiology community is a lack of standards for medical images. Since these rules will govern federal incentive payments and, eventually, penalties on noncompliant facilities, they could prove to be a challenge for radiology departments and imaging centers. Medical facilities must always prioritize funding among multiple projects and with federal incentives being dangled for EMR implementation, most administrators are looking for ways to qualify for those funds. But since medical imaging isn’t a key part of that formula, radiology projects may become a harder sell. But even though the new rules will give EMR-related projects a leg up, they don’t completely freeze out radiology. One problem with the initially proposed rules was that hospital-based providers would have been ineligible for incentive payments, leaving administrators with an all-or-nothing choice when evaluating the merits of non-EMR projects. The final rules that took effect in July are more lenient. Although they don’t mention any specialties by name, they allow more exemptions that will make it easier for radiologists to qualify. While the final rules leave more leeway for hospital-based radiologists, Erickson says there are some strategies that stand-alone imaging centers can use to increase their chances of qualifying. This is especially important because after the first few years, those incentive payments will be replaced by penalties for noncompliant facilities. He says the first step is to make sure RIS and PACS systems are certified by the Office of the National Coordinator for Health Information Technology. Erickson also suggests working with referring physicians to capture information such as smoking status, which is one of the new requirements. Or if the practice sees pediatric patients, growth charts need to be included. By the same token, if the practice does not see pediatric patients, it makes sense to apply for an exemption. He says practices may also want to consider decision-support tools, such as mammography/computer-aided detection, that might help them qualify. “[For] a practice that’s teetering on the edge of deciding whether to get a computer-aided decision-support tool, this might be the thing that tips them over in favor of getting that sort of a tool,” says Erickson. Although there are more potential avenues to funding, the rules could prove problematic for radiology. Wendt says even though improved PACS efficiency isn’t directly related to meaningful use, improved image sharing benefits the entire medical community. The University of Wisconsin’s radiology department currently is limited to internal funding for its regional outreach projects, according to Wendt. External funding would not only allow them to pursue more projects, it would also potentially provide a greater return on investment. Part of the problem is that EMRs and PACS are dissimilar systems, and more physicians use EMRs than PACS. 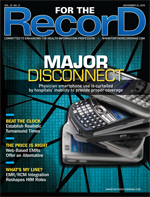 It will largely be up to radiology departments to make connections with EMRs. In Wendt’s opinion, the best ways to do that are to make PACS as efficient as possible and remain focused on patient care. And, Erickson adds, radiologists who aren’t up-to-date on the new requirements should attend educational sessions at conferences to find out how the rules work. “Radiologists who don’t understand what they need to do would be well served to attend those sessions and to learn what they can do because it’ll be incentive money now and it will be penalty money later if they don’t figure out how to comply with these regulations,” says Erickson.